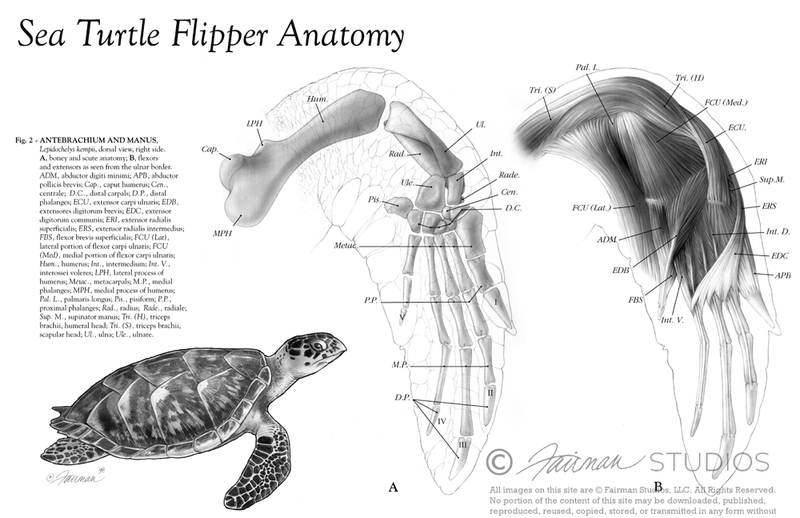 This anatomical plate was created for scientific publication, illustrating the muscular and boney anatomy of the Kemp’s Ridley Sea Turtle flipper. It was executed and drawn completely from dissection. The final plate was the recipient of the Association of Medical Illustrators Certificate of Merit, in the Editorial category at the 1998 Annual Meeting, held in Toronto, Ontario. Medium: Airbrushed Watercolor and Film Pencil. The Kemp’s Ridley Turtle (Lepidochelys kempii) is the smallest of all sea turtles. Adult Kemp’s Ridley sea turtles weigh 80-120 lbs and are 26-30 inches long. Their wide, almost round carapace is olive gray, and their plastron is white to yellowish. The hatchlings are darker colored, almost black, and only 2 inches long when they are born. The Kemp’s ridley sea turtles were listed as endangered under to the Endangered Species Act (ESA) in the United States in 1970. This makes it illegal for anyone to disturb, kill, or take the eggs of the Kemp’s ridley. Although the population is showing early signs of recovery, the species is still considered highly endangered.